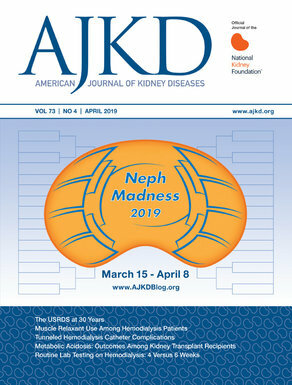 Making our first NephMadness appearance in 2016, the Pediatric Nephrology region initially felt like the 1999 Gonzaga Bulldogs. At first, we were just happy to be invited, but pretty soon started to realize that we have a real chance to take it all. And, if we do our jobs right, all of our teams will survive the tournament intact to transition to adult nephrology in future seasons. Let the games begin! Michelle Rheault is a pediatric nephrologist and pediatric dialysis medical director at the University of Minnesota Masonic Children’s Hospital. She is also a clinical researcher with interests in Alport syndrome and nephrotic syndrome. She is on the steering committee for the Midwest Pediatric Nephrology Consortium, a group of pediatric nephrology centers who collaborate to perform research in this rare population. My prediction: Typical hemolytic uremic syndrome (HUS) wins in a landslide. HUS is the triad of microangiopathic hemolytic anemia, thrombocytopenia, and acute kidney injury. It’s a frustrating disease because we can all see it coming a mile away, but there’s nothing we can do about it. Shiga-toxin associated HUS (as typical HUS is better known) is a major player both in terms of numbers of patients affected worldwide and impact on pediatric nephrology practice. Most shiga-toxin associated HUS is caused by infections with E. coli O157:H7, which are more common in children than adults. In 2014, the CDC reported the incidence of E. coli O157:H7 infections as 3.34/100,000 in children <5 years of age, ~2/100,000 in children age 5-19, and ~1/100,000 in adults. Around half of E. coli O157:H7 infections are acquired from foodborne sources with the remainder from water, person-to-person transmission, and animal contact. (I guarantee you’ve never seen a pediatric nephrologist’s kid at a petting zoo or eating an even slightly pink hamburger.) About 2-14% of children infected with E. coli O157:H7 will develop HUS. Risk factors for developing HUS after infection include antibiotic treatment during diarrheal phase, vomiting, and higher WBC count at presentation. Approximately 40-50% of those affected will need dialysis. In human terms, that is about 10-20 children per year in Minnesota for whom I and my local colleagues have the privilege of explaining to parents that their child is in renal failure and we need to start dialysis. Although less common, there are other shiga toxin producing E. coli that have been responsible for some large outbreaks, including an E. coli O104:H4 outbreak in Germany in 2011 from contaminated sprouts. This outbreak affected mostly adults and had a high rate of 22% developing HUS. Risk factors for developing HUS in this adult cohort included vomiting, visible blood in the stool, age >75 years, and increased WBC count. Finally, Streptococcus pneumoniae is responsible for about 5% of childhood HUS, most commonly associated with pneumonia and is probably under-recognized. It has been proposed that enzymes produced by Strep. pneumo expose a T-antigen present on glomeruli, platelets, and RBCs. Auto-antibodies then bind to the exposed T-antigens leading to HUS. Alternate theories invoke unregulated complement activation due to disruption of complement factor H binding. Regardless of the cause, treatment is largely supportive. Although improved in recent decades, mortality is a real concern in the acute phase of typical HUS and was reported in 2.9% of affected children in a recent US review. Risk factors for mortality in children with HUS include elevated wbc count and seizures in the first week of presentation. There is also significant short-term and long-term morbidity for children with HUS. Approximately 5-15% of children develop chronic hypertension, 15-30% proteinuria, and 20% chronic kidney disease and require long term nephrology follow up. In short, this team sneaks up on you, hits hard, and keeps you thinking about it for a long time. Atypical HUS can be distinguished from its better known rival by the absence of preceding diarrhea, the tendency to recur, and generally poor renal outcome prior to the introduction of effective therapy. This is a very rare disease with an estimated incidence in the US of 1 in 500,000 per year. Hypocomplementemia was found in patients with atypical HUS as far back as 1977 and provided the first clue to the pathogenesis of this disorder. In the 1990s, complement Factor H (CFH) gene mutations and absence of CFH were first described in patients with familial HUS, starting the modern genetic atypical HUS era. (Forgive me for a moment here if my eyes glaze over during the discussion of the complement system…) Dysregulation of the alternative complement pathway has been found to be the cause of 60-70% of cases of atypical HUS including inactivating mutations in factors H and I, membrane cofactor protein, or thrombomodulin, anti-complement factor H antibodies, or gain-of-function mutations in factor B or C3. Rarely, atypical HUS can be caused by non-complement related mutations such as those in DGKE or cobalamin C, although these players don’t get off the bench much. Recent international consensus guidelines were published to guide the workup of children with atypical HUS. Prior to the first reports of treatment of patients with atypical HUS with terminal complement blockade (eculizumab) in 2012, treatment consisted of chronic plasma exchange or plasma infusion. Although better than nothing, complication rates and rates of renal disease progression remained high. Several small prospective non-randomized trials of eculizumab in atypical HUS in recent years have demonstrated remission of hematologic disease activity and improvements in eGFR. Eculizumab is recommended as first line therapy for children with atypical HUS. Complement blockade increases the risk of meningococcal infections and children should be vaccinated prior to initiation of treatment. Use of immunoprophylaxis in children treated with eculizumab is somewhat controversial, but generally provided. Atypical HUS is really a young team and I expect it to mature over the next few years as more is understood about pathogenesis and more specific complement inhibitors are developed. Until then, each new patient will find me curled up with some papers reviewing the complement cascade and discovering what new mutations I should be checking for in my patients.